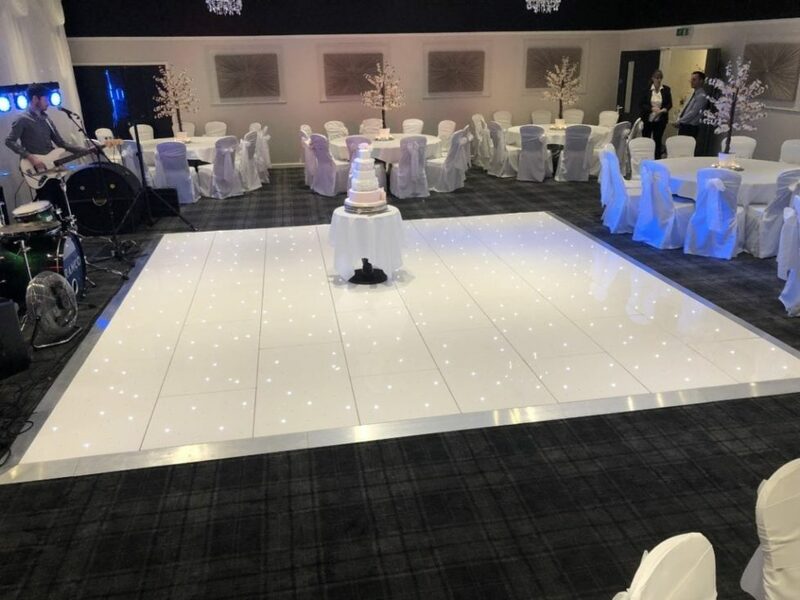 The terms LED Dance Floor, Sparkling Dance Floor and Light-up Dance Floor all usually mean the same thing, and as you can see from the photographs add an unmistakable touch of class to any wedding or party celebration. 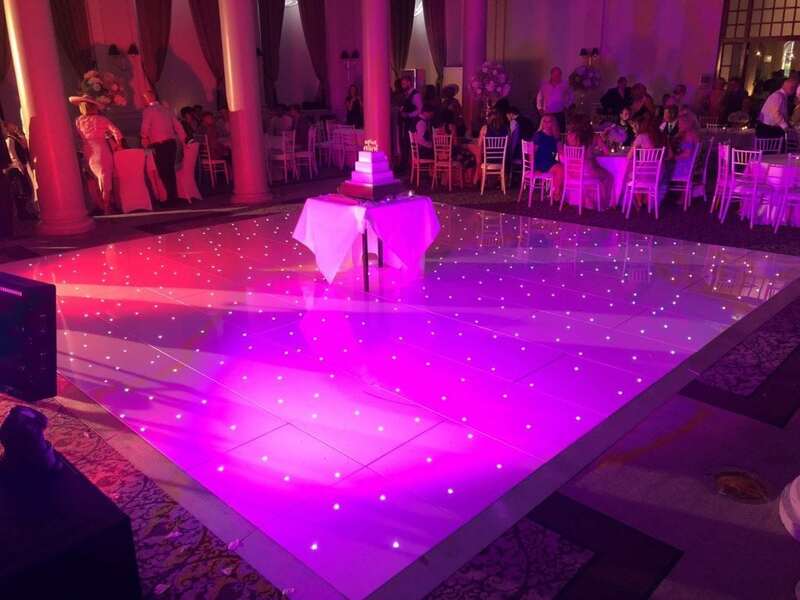 My white 20ft by 20ft led dance floor at The George Hotel, George St, Edinburgh. Dancing on one of our floors is a fantastic experience. There is a real sense of it being something special, almost like going on stage and the atmosphere is electric. Everyone enjoys the feeling particularly a bride and groom during their special first dance as husband and wife, It is difficult to describe and has to be seen to be fully understood. As a focal point of the room there is nothing that can match it. 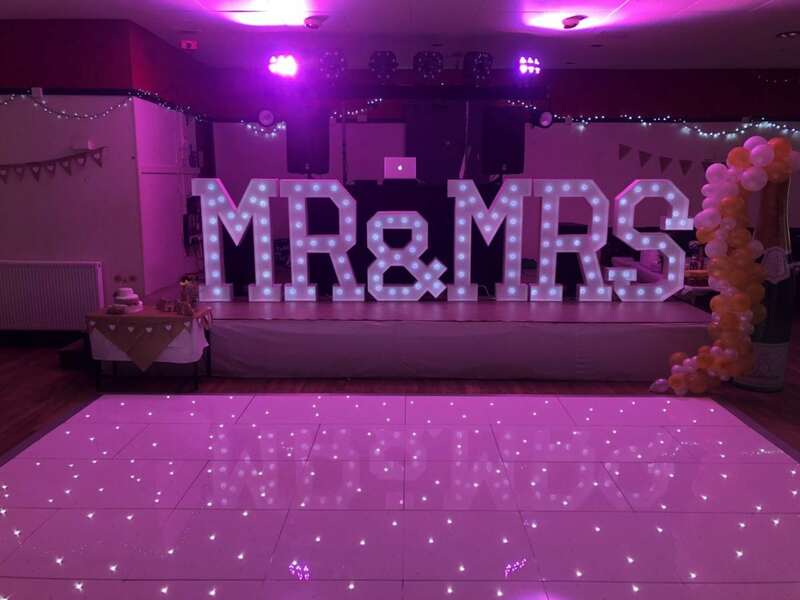 4ft tall Mr & Mrs letters and LED dance floor at Crossgates British Legion Club Fife. Dancing to your favourite tunes is more enjoyable and you magically become a better dancer when strutting your stuff on one of our floors. Younger members of the family adore the floors and the overall effect is one of class. Setup takes our expert operators less than an hour, and the floor can be laid before an event begins or during room turnaround time. Powered by 12 volts the system is completely safe and an accidental spillage of drink won’t result in anyone being hurt. After a great deal of deliberation Platinum Discos have decided to offer this fabulous dance floor product at a crazy hugely discounted price to the first 20 people who make a booking. This offer is a one-off and won’t last for ever so don’t delay, book yours now! To claim your special offer deal call this number 07472 287 151 and speak to Ashley. Remember to mention “Seal a Deal” and you will be awarded a fantastic money off discount on your dance floor hire. Alternatively, please use the online “Seal a Deal” contact form by clicking here to claim your deal. Remember, he only has so many discounts he can give away. Even if your wedding or party is still some way in the future, book now to lock in your price and seal your deal !